Amen to that. Over the past decade or so, I have very much enjoyed following the evolution of Ypsilon electronics, both at audio shows and in my own system. Ypsilon, which is manufactured in Athens,Greece, is essentially a bespoke operation—all transformers are wound by hand—that has steadily been attracting more attention. TAS’ Neil Gader, no newbie when it comes to judging audio equipment, declared in December 2017 in these pages that the Ypsilon integrated Phaethon is a component that “intensifies and stimulates and recalibrates one’s audio senses like few that I’ve encountered before.” It would be difficult to disagree. I first listened intently to the full Ypsilon rig at the Rocky Mountain Audio Fest several years ago, where I was most impressed by its suavity in disentangling complex musical passages. There was a lissome quality to the music, a lack of grain and an abundance of tonally purity, that took my breath away. The first piece of Ypsilon kit, as the Brits like to say, that really impressed me in my own system was the Aelius monoblock amplifier, which I coupled to my beloved Magnepan 20.1 loudspeakers. I was smitten by the Aelius’ speed and clarity, particularly in the treble. But after I moved to the Wilson XLF loudspeaker, I took a deep breath and the sonic odyssey continued. I switched to a very different amplifier in the Ypsilon line—the much more expensive and elaborate SET Ultimate Mk. II that outputs about 120 watts. It coupled very well to the XLF, which presents a fairly benign load to amplifiers. The SET version, which Ypsilon chief designer Demetris Baklavas has upgraded several times over the years at my home (including replacing the copper with a silver interstage transformer), has a very continuous, for lack of better word, sound that I ascribe to the fact that it is always operating in Class A. When it comes to improvements, Baklavas, for the most part, has ensured that buyers of earlier versions are not left out in the cold, as it were, but can upgrade their respective components if they wish. When it came to the SET amplifier, the move from copper to silver did not result in a faster but more strident sound, as often seems to be the case with high-end gear that uses silver wiring. Instead, the switch actually created an even more mellifluous and supple presentation. Now Ypsilon’s Baklavas has introduced a new monoblock Class AB amplifier with transformers wound entirely with silver wire. It outputs around 100 watts in Class A before switching to Class B and boasts an overall 370 watts into 8 ohms. All that Class A power, friends, means that this hefty amplifier runs pretty darned hot. It’s a hybrid design, as are most Ypsilon amplifiers, with a stout 6H30 or 5687 tube on the input (there are two sockets, so you get to choose which you want to employ), along with an EZ81 rectifier tube. So the obvious question for me was: Was it time to make the move to the Hyperion? Or would the SET amplifier continue to rule the audio roost? Upon inserting the Hyperion into my system, I enjoyed the sound but was not overwhelmed. It was a little grainy and closed in. But I quickly realized it was going to take a lot of break-in to hear what the amp was capable of. After a couple hundred hours and some tube fiddling, it became apparent to me that Ypsilon had hit a homerun with its new statement amplifier. When it comes to continuity on vocals, there is still something about the SET amp that I don’t think the Hyperion matches—a kind of ineffable (there’s that word again) quality that is hard to describe but definitely there. 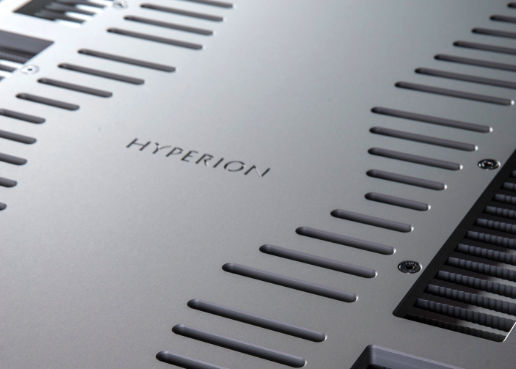 Overall, however, the Hyperion is hands-down the superior amplifier. Put bluntly, it is one of the very finest I have ever heard. Uniting power and finesse, refinement and seductiveness, this magnificent amplifier offers an enticing blend of the virtues of the Aelius and SET that my Wilson WAMM Master Chronosonic loudspeakers positively feast upon. There is a lucidity and lack of midbass bloat with the Hyperion that makes it an excellent match with the WAMM. I definitely preferred using the 6H30 to the 5687 because it added a good deal of slam and drive to the presentation. Because the WAMM is harder to drive than the XLF, one advantage that the Hyperion had going in was extra power. The SET amplifier was able to drive the WAMM, but the added wattage of the Hyperion meant that the WAMM was a lot more relaxed on demanding passages, particularly in the nether regions. Plop on a big Mahler symphony, a Verdi overture, or a sassy Count Basie number, and the Hyperion sails right through it.